What does tunnel vision mean? Got your blinders on? Then you are experiencing tunnel vision. Literally, tunnel vision is a term meaning that the edges of your vision are lost and only central focus remains, as if you were looking through a tunnel. Figuratively, it is a lack of perspective caused by intense focus on one object, leading to neglect of your surroundings and responsibilities or being closed off to other viewpoints. Mr Trump’s (and his advisers’) tunnel vision on trade could also greatly harm American corporate performance abroad, if or when tariff retaliation leads to exclusion of American capital investment and barriers to subsidiaries’ expansion. Where does tunnel vision come from? Tunnel vision emerges in the mid-1930s as popular term for when automobile drivers lost vision out of the sides of their eyes (their peripheral vision). Besides taxing the eyes when being too long on the road, a variety of other things can cause tunnel vision, including retinal injury, drugs and alcohol, emotional stress and panic attacks, and oxygen deprivation. Certain types of eyewear and headgear, such as diving masks or thick glasses, as well as tools like binoculars may also create tunnel vision, as they block out peripheral vision to focus the wearer’s vision in some way. The figurative use of tunnel vision appears as early as as the mid-1960s. This tunnel vision is often an unconscious condition—people who have tunnel vision are so focused on something that they don’t realize they have tunnel vision. This can be both a strength and weakness. 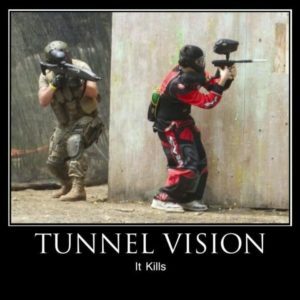 In combat, for instance, tunnel vision may help a soldier zoom in on their target or mission, but it also exposes them to attacks on their blindspots. In contemporary culture, tunnel vision is frequently used as a criticism against people or organizations who lose sight of the big picture. This could be a student, whose tunnel vision on getting straight As could lead to neglect of other relationships. It could also be the US population for too easily getting sucked into a single issue while overlooking potentially more important topics. Tunnel vision is also a common enough expression to inspire pop culture, such as the 1976 comedy film Tunnel Vision, starring Chevy Chase and John Candy. 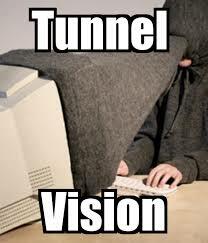 There are two notable songs called Tunnel Vision. One is by Justin Timberlake in 2013, who has his sights set on one girl (“I got that tunnel vision for you”). Another, from 2017, is by Kodak Black, who raps about keeping a good head on his shoulders (“My mama told me: ‘Boy, make good decisions!’ / Right now I gotta keep a tunnel vision”). People are getting tunnel vision about Roe v. Wade. Even if this far right justice declines to hear a case that directly challenges Roe, they can and will still gut the spirit of the law. 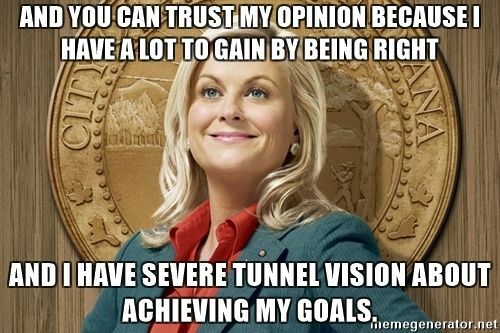 Although tunnel vision is often criticized as being narrow-minded or causing an unhealthy obsession, it can also be viewed as a positive, since it results in effective work and research, you know like being in the zone. Develop tunnel vision. No matter what's going on around you…Be selectively focused on your goals. 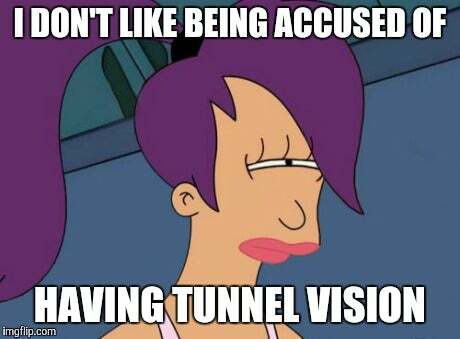 Due to how it limits actual vision, the literal tunnel vision can be very disorienting and may lead to accident or injury. Careful!